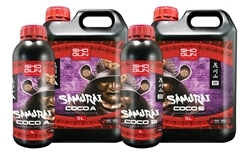 Samurai Coco A&B is a 2 part complete coco nutrient feed to rival all others. With precision ingredients Shoguns Samurai Coco offers balanced high grade nutrtion to support plants through the whole grow and bloom cycle. 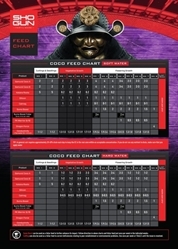 Shogun Fertilisers are proud to introduce two unique features; SmartZen Maximiser and AquaZen slow water formulations - both bringing the latest in cutting edge plant technology to further impose the superiority of Samurai over all other currently available fertilisers. 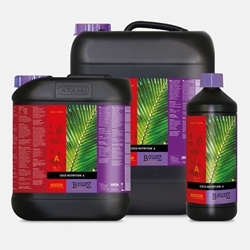 Dilution rate is 2-4ml per Litre through Grow and Bloom Phase. 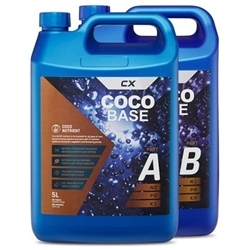 Coco BASE nutrient is formulated for all types of hydroponic systems and used with CX Horticulture nutrient additives. This A&B formula has been supplied to commercial growers in other parts of the world for almost 20 years; as hobby growers have become more sophisticated in recent years, and the demand for a high performance feed has increased, CX have released the BASE formula to the European market.  This highly adaptable 'straight through' formula can be used in any type of coco based systems.